When I was younger, I always wanted to know what people carried with them in their bags (aka nosey). I loved the one page articles in magazines, detailing what movie stars kept in their bags from their own perspective. It offered me a glimpse into other people's daily routine and personal habits that I found so intriguing. While I still enjoy a good bag tour, my interest has switched from movie stars to herbalists or artists I admire. What keeps peope feeling powerful and rejuvenated throughout the day, I always want to know! I was a fan of Sarah's before I even met her. Spending 3-5 days a week with the other half of The Kosmic Kitchen, Summer, at The California School of Herbal Studies in 2013, I heard so much about her. We finally met while Sarah was taking a break from her time at the Tassajara Center, I was instantly taken with her knowledge and sense of humor. Sarah is also a badass healer. I recently had the opportunity to have a phone consultation with her, and it was beyond helpful. The Kosmic Kitchen offers consultations in addition to radical herbal workshops. 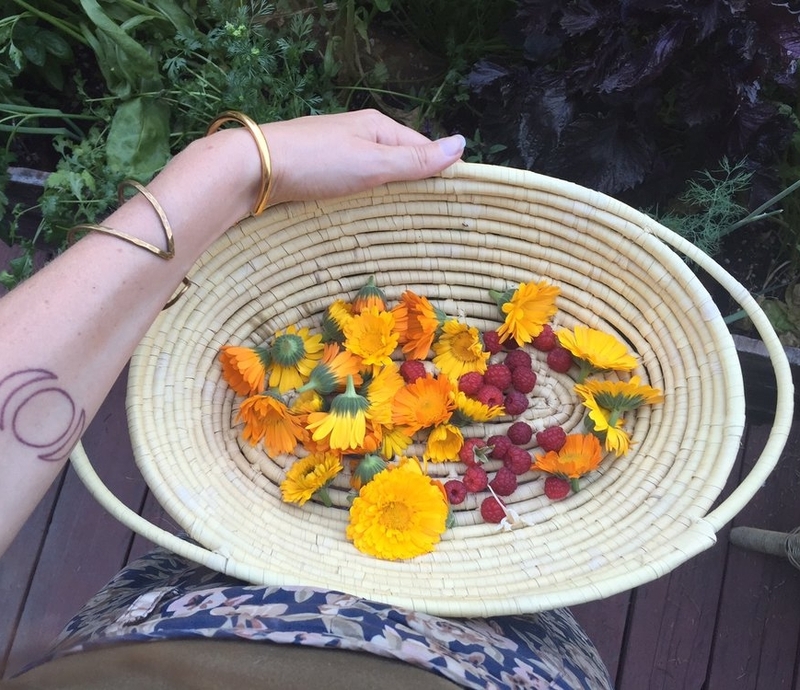 They have a workshop coming up called Elemental Eating, that focuses on providing a greater sense of the elements that make us, nourishing meals and useful tools for self care. It's on April 1st, 2018 and if you are interested in signing up, you can do so HERE. It's an online workshop, so no matter where in the world you are, you can join! When Spencre asked to peek into the bag I carry everyday, I of course was excited to share. My “bag” these days is a Jane Birkin style french woven basket because carrying something on my shoulder was starting to feel a bit straining and hard on my posture. You can usually find me with a basket in tow, since I’ve started somewhat of a collection. What can I say? I just love how you can toss in all the things---clay water bottle, snacks, books and your essentials or use it to harvest wild weeds. It's funny how much of a conversation piece holding a basket instead of a purse is. Everyone just automatically thinks I’m going on a picnic. Which honestly, isn't a bad thing because who doesn’t want to have more picnics? Okay, enough basket talk, here’s what’s actually in that thing! Fat & The Moon Lip + Cheek Stain | Summer got me this from Rachel and I love how it instantly brightens up your face with the most delicate scent and texture. Planetary + Flower Essences | Stargazer Li is a magical human making some seriously magical planetary essences here in West Sonoma County. I’ve been carrying their Cosmic Fabulosity around to aid in, “finding + expressing our true voices + gifts with playful relaxed grace and dignity.” I’ve also been using a drop of Easter Lily essence the week before mooning to help ease cramps and to help my body remove stagnation. Cannabis salve | My friend gave me a cannabis and St. John’s Wort salve he made for my birthday and it's so relaxing to my muscles. I love applying before bed to help calm down my vata nature. Though he doesn’t sell it, Kari of Poppy & Someday makes a similar salve that I bet is really wonderful too. Simplers Sinus Oil | This stuff! I started using this years ago and recently got my partner into it. It's great to use during times of sickness or if you want to help ward off anything that's going around. You don’t need much since essential oils are so potent, but a little swab inside your nose does the trick. Weleda Hand Skin Food | I’ve been looking for a really good hand cream since my hands get so dry from kitchen work. I love how thick it applies so my hands feel instantly rehydrated without feeling greasy. Braiding Sweetgrass | I’m in love with this book and am probably the last herbalist on the planet to read it. But seriously, why did it take me so long to crack this open? Robin’s writing instantly brings me to the present moment and reminds me to give reverence to the magic and healing swirling around us all the time.